Decoying ducks, geese, turkeys, and big game has been well known for years. Refinements in designs and improvements in realism over the last 10 years or so have taken a turn for the better giving hunters a wide variety to choose from…along with a wide variety of pricing options. Before I started designing and manufacturing Heads Up Decoys, I had no desire to use a decoy for the simple fact that I couldn’t find a decoy that fit my price range and the functionality that I wanted. So if you are considering purchasing a decoy, a decision needs to be made before you select a decoy (focusing only on turkey and big game) to address what you are willing to pay, what functionality you desire, effort you are willing to put forth, and expectations. Failure…you need to be willing to accept a certain amount of failure associated with using decoys. Let’s be honest…it ain’t gonna work every time. The reactions you will see can range from point blank encounters where you can’t scare the animal away to spooking at the very site of the decoy. 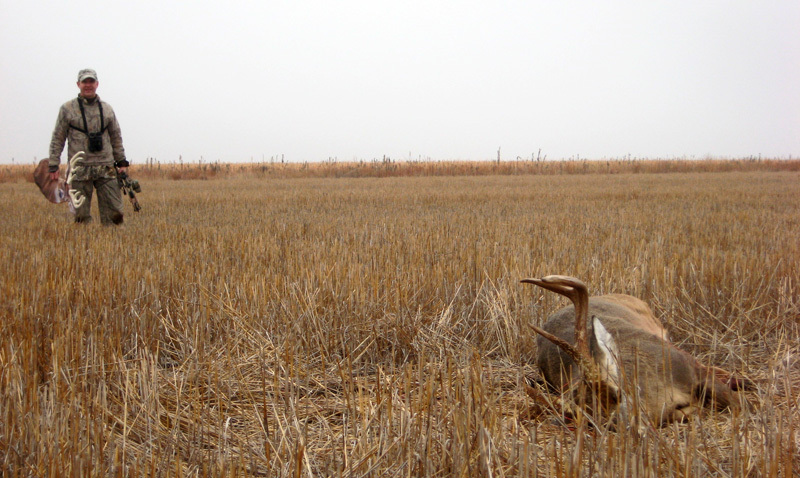 Tolerance is very important to the overall success of using decoys…especially with deer and pronghorns. If you set up your decoy and it doesn’t work “out-of-the-box” and you give up…you will miss out on some great action and lasting memories along with developing your own techniques that make the decoy work consistently for you. Don’t give up. Before purchasing a decoy ask yourself: How do I hunt? How am I going to use it? How do I want the decoy to perform? How much am I willing to pay? and When am I going to use it? I always tell people that if you are hunting over nutritional attractants: small food plot, corn pile, or water…a decoy is not something I would personally recommend because there is no need, but I would be happy to sell you one. Quick pros and cons of 2D and 3D decoys: With a 3D decoy, you have to be willing to haul it to and fro, tolerate the bulk, know the fact they are not always the quietest to maneuver with, stationary, and not very versatile…but very realistic. 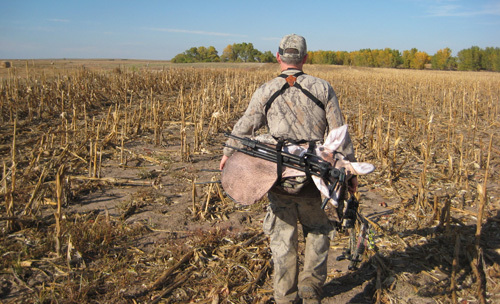 With a packable 2D decoy, when hunting stationary you must be willing to accept the fact that at some point the decoy may disappear on an approaching animal, the animal may never see it, they are realistic half of the time, can move erratically in windy conditions, but can be very versatile to use if you are willing to be versatile or aggressive. So the take home message with purchasing a decoy is knowing the fact that they all work, but the purchase should depend on finding one you can incorporate into your hunting style and committing to it and giving it a good run. Remember these two statements: 1) No decoy has ever worked from base camp, buried in the garage, or left in the truck. 2) There will be a time or has been a time a decoy would have sealed the deal for you on a great animal. Bowhunting and decoying: I generally like to keep things simple. I think it is important to keep things simple and then build from there. Two things I make sure I do when using or operating the decoy are making sure the animal sees it, and then making sure the decoy moves while the animal is looking at it. Not every animal we hunt is “vocal” in real life so calling isn’t always an option, so I do whatever it takes for the animal to see the decoy. And, for those animals that are vocal in real life, I use calling to get the attention, challenge, or entice while operating the decoy and letting the visual effects and movement convince the animal long before bow range that I am the real deal. Visual contact+movement+calling=dead animals…or close encounters. There are some main considerations one needs to do to make decoys work more often. The first and foremost is to set up or operate your decoy so the animal can see it from a distance. Deer, elk, pronghorns, and turkeys do not like to be taken by surprise. When I use Heads Up Decoys…I stop at nothing to make the decoy visible to the animal I want to attract, even if it means holding the decoy high above my head and running with it in my hand. No matter how you set your decoys up or how you use your decoys…it has to be seen to work. I know that sounds obvious, but beyond that, see how the animals react and fine tune your positioning or method you use the decoy to get the desired reaction. The second and equally important aspect of getting a decoy to work is creating a scene that gives the animal the impression that your “fake” is real. Calling, rattling, and movement are great enhancers to your set up. 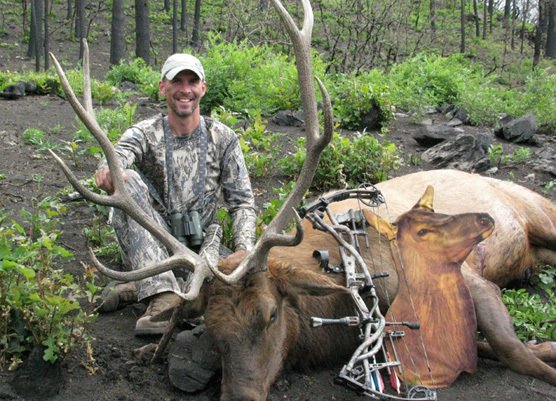 The objective is to convince the animal you are decoying that this is the real deal long before they enter bow range. If you chuck a decoy out and expect it to work because it looks real, you are going to fail the decoy and the potential effectiveness of the decoy. Again, I have personally found that movement is extremely critical. For example, if you are raising a ruckus, but nothing is moving, that doesn’t make sense, especially when the scene of the ruckus can easily be visualized. Heads Up Decoys, with the exception of the turkey decoy, are double-sided face-on decoys with no posterior features so positioning them for stand hunting is interesting…then throw in the fact they are silhouette and that’s another factor to consider. For 3D decoys, the general consensus for deer and turkey hunting is to position the rear of the decoy in the direction you anticipate the animals to be coming from when they see the decoy. This makes the animal have to loop around to make eye contact to posture, hopefully at a point blank range. If the animal approaches from the face on direction you will be in position and not have to be concerned about them “hanging up” up out of range. 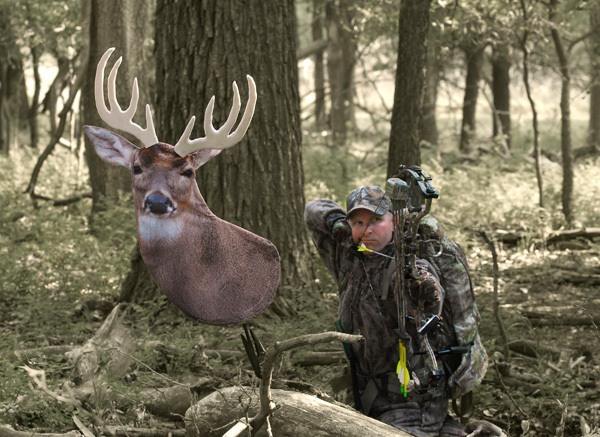 Never ever set up your decoy out of bow range when hunting from a stationary location…EVER. Hunting from a stationary position with my Heads Up Decoys, I generally like to set my decoy up beyond my location where I anticipate the animal to be approaching to draw the animal to me or focus beyond me. I learned a hard lesson my first evening out during the 2011 KS archery deer season. I took my three year old son with me one mild October evening...no expectations frankly. Had the perfect ground blind set up, but I totally tanked the decoy positioning. It cost me a nice 140 class buck. I was looking for bigger, but my son was with me and I would have been happy to arrow him. I knew the direction the deer would approach with confidence, but I placed the decoy out in front of me about 15 to 20 yards. The buck came in to 15 yards of the decoy, but no shooting lanes where available. Remember I have 2D decoys that have “face-on” frontal images. Had I placed the decoy to our left and back, the decoy would have still been in full view. With the buck reacting the same, he would have stopped and postured front and center 15 yards broadside. I try to hunt with more sense than scents, but I do utilize scent attractants from a stationary position. Hunting from the ground, I obviously work the wind to my advantage nulling out the use of scent attractants. However, scents are another component to provide a realistic affect for animals approaching from downwind. In my opinion, applying an attractant scent like an estrus scent or buck in rut scent directly to the decoy is like dumping cherry Kool Aid on your cream colored carpeting, it is there for life. Or, at least until you cut it out and replace it. I am not a big fan of applying scents to the decoy, obviously. I would suggest applying the scent on the ground or by a nearby tree or scrub where it can catch some wind. I think a common mistake we all are guilty of is giving the animal too much credit. The animal you are going to shoot will not know if the scent is coming from the decoy or from a nearby scrub or the ground. Put it this way, if a 180 class whitetail buck approaches your decoy set, I would hope you would have put an arrow in him before he stuck his nose in the rear of your doe decoy. Scents are like decoys, they are going to work or they’re not. The reason I don’t like applying scent to my decoy is because I want to use my decoy all season long, opening day to the moment I tag out. Most scents are rut driven and applying scent directly to the decoy is essentially limiting the time of year that I can use it. As the owner and designer of Heads Up Decoy, I do not consider myself an expert at decoying animals. I am still learning and improving not only my products functionality, but also my ability to place myself in a situation where the decoy has an opportunity to work. To provide some insight on why I started Heads Up Decoy, it had to do with building an elk decoy that I felt fit what elk hunting was all about…fast paced and mobile…and effective enough to coax a bull to within 40 yards. We’ve incorporated that philosophy in all our models. So when people ask us how to use them, I say without embarrassment: “I don’t know.” The reason I say that is because we are breaking new ground with decoying, every scenario is different requiring its own unique approach. I am still learning what I can and cannot get away with. At this point, everything is on the table, so grab your decoy and get out there and try it. 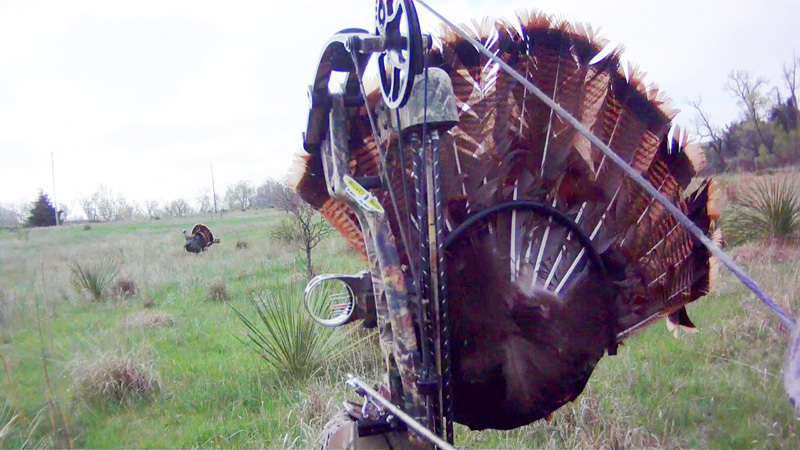 If I would make a suggestion about bowhunting with decoys, do not let past magazine articles and/or current protocols for hunting deer, elk, and turkeys keep you from being a versatile hunter and miss out on some truly crazy moments in the field. In closing, I think we would probably all agree that we don’t like to attract every elk, deer, or turkey that comes in visual contact with the decoy. We generally are after a specific target. Probably the biggest hang up I have with decoys in general, mine included, is when they are set up and not in my control…they are seen by every animal that crosses its path, stationary, and often motionless. Which leads me to my final thoughts about decoy, bowhunters can take their hunting to new levels of excitement if one would make the decision to hunt with their decoy verses taking a decoy hunting. Hunting with your decoy can turn sightings into legitimate encounters without showing the decoy to every animal on the mountain or the property. You sometimes cannot be aggressive enough…which really makes it fun. It can open new opportunities in places you previously would have considered unhuntable. Lastly, don’t be discouraged if the decoy doesn’t work every time. 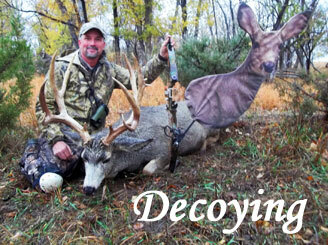 The more one hunts with their decoy, the better and more often it will work. Be Mobile…Stay Mobile.